The "Tour De Kite 2016" continues, sponsored by the Kite Society of Wisconsin & Illinois, and Gift of Wings! Gift of Wings kiteshop in Veterans Park is now open Weekends, weather permitting 11 am until dusk! . Visit our aviation and kite store in Franklin on Hwy 100 and Hwy 36 & in the Historic Greendale Village on Braod Street. Would your School, senior Home, or church like to be involved in a "Random Act of Kite-ness?" If So, contact Scott at 414/425-9993. You never know when Gift of Wings may drop into your organization with kites!! ..New Years Day, 2016..LIVE ON THE INTERNET ON THIS WEB SITE!! 11 am until 5 pm. in Veterans Park on Milwaukee's Lakefront. Free Hot Chocolate and coffee, compliments of Bella Caffe, and snacks while they last. Oh, it's soooo much fun! The 29th annual Maggiano's Little Italy FAMILY KITE FESTIVAL will be held Saturday, May 28rd and Sunday, May 29th 2016. NOW 2 days long! Sponsored by Trending Radio 93.3, FM 102/1 and 1290am & 100.3 FM, Milwaukee's Oldies Station, Gift of Wings, and the Kite Society of Wisconsin and Illinois. Featured performers include Chicago Fire... 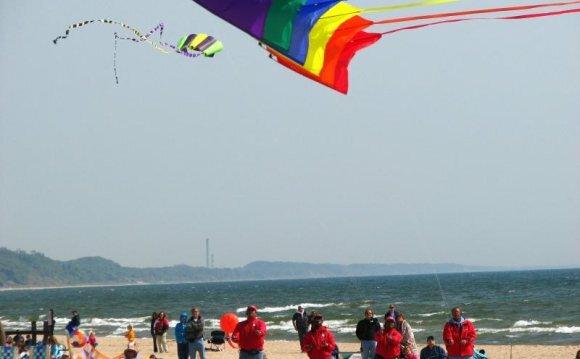 The 15th annual " 92.1, THE SHORE Outta Sight Kite Flight" will be held on June 4th & June 5th, 2016, from 10 am until 5 pm. This free event, with free parking, will be held in Kennedy Park on Kenosha's beautiful lakefront. Sponsored by our good friends at THE Shore 92.1 and Your Radio Friend WRJN am 1400! EAA Wings on Strings The Tour De Kites...Sorry..EAA HAS CANCELED THIS EVENT AGAIN for 2015. We are talking with them about 2016. …. Please see our full announcement on our Facebook page . . KSWI in Conjuction with Gift of Wings, US Bank and Milwaukee County Parks will sponsor our annual Fireworks Kite Festival. Featuring the Giant kites of Yves LaForest. This is a fun fly and all are welcome to participate. Our goal is to fill the sky with as many kites as possible. Times from 11:00 am until 6:30 PM.